Heat oven per instructions on the Pizza Dough package. Roll the Pizza Dough out on a floured surface until it makes a circle that is the desired size for your pizza. Very gently, move Pizza Dough onto your pizza stone that has a been dusted with Corn Meal. Make a little mound along the outside of the Pizza Dough to make a crust for your pie. Brush the BBQ Sauce onto the Pizza Dough inside the pie part. Be careful to not get too much on the crust... it can tend to turn a weird brown color when baking. Then lay down a thin layer of the Daiya Cheese and then follow with the BBQ Mock Meat and then add the rest of the Daiya Cheese. Take the rings of Red Onion and place where you want them for the desired slices later. Put in the oven and bake until Daiya Cheese is melted and Crust is a golden brown.. You’ll need to check your Pizza Dough package to get a ballpark on that. Ours took around 20 minutes. Also, thicker crusts take longer, so that is also something to consider. Another good tip is if you’ re unsure, use a spatula to GENTLY check the bottom of your pizza. You'll know right away if it doesn't look and feel done. 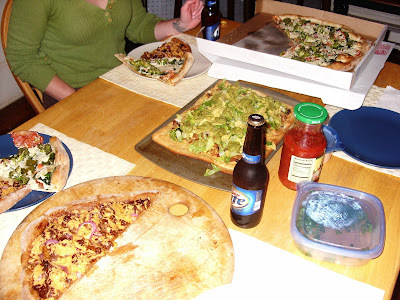 Scene from The Pizza Party starring Betty's Ranchero Pizza, Mexican Pizza and a White Pizza from YNot also featuring Beer. Thanks for posting this. It sounds amazing!!! omfg that pizza looks soooooo good. 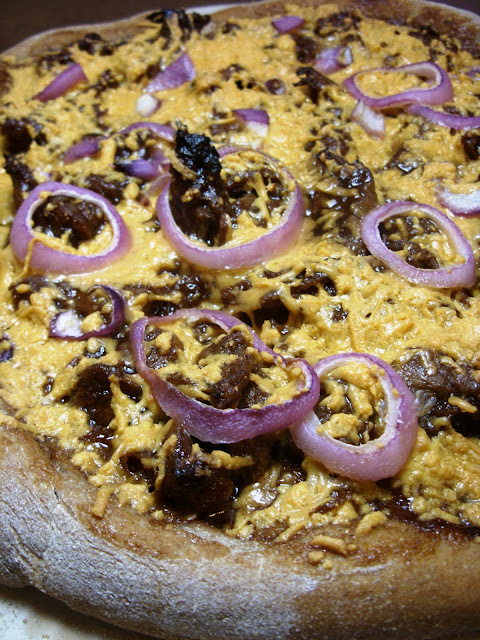 i want a daiya pizza right now. I made a pizza last week with Daiya shredded mozarella - it was amazing... it actually melted and browned, oh I am so in love with this! Watch the fat content, if that's a concern though. I used the whole packet!